My newly-minted United States Patent No. 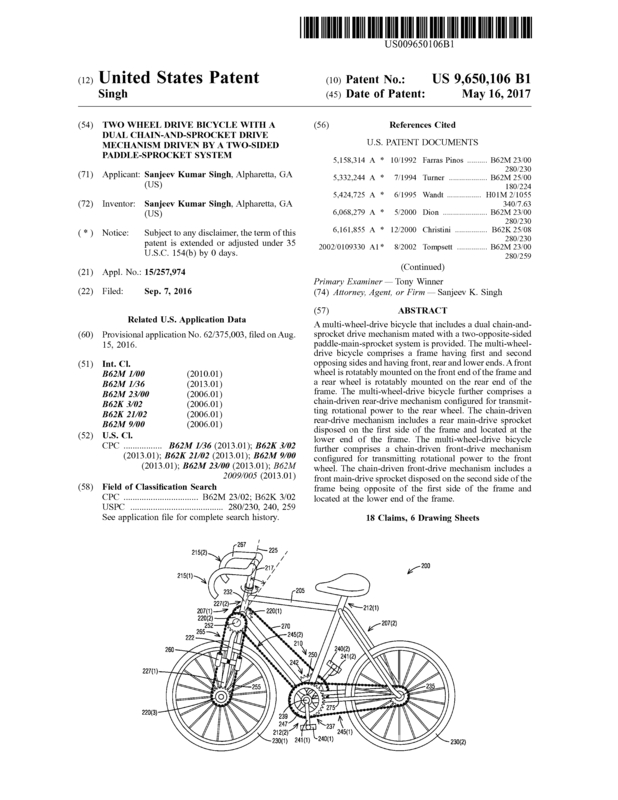 9,650,106 granted on May 16, 2017: Two wheel drive bicycle with a dual chain-and-sprocket drive mechanism driven by a two-sided paddle-sprocket system is available for licensing or sale. This is more than a bike. It is infinitely amazing to ride on. The world of cycling will never be the same. Good luck with your spirit of traveling. We would love to hear from you! 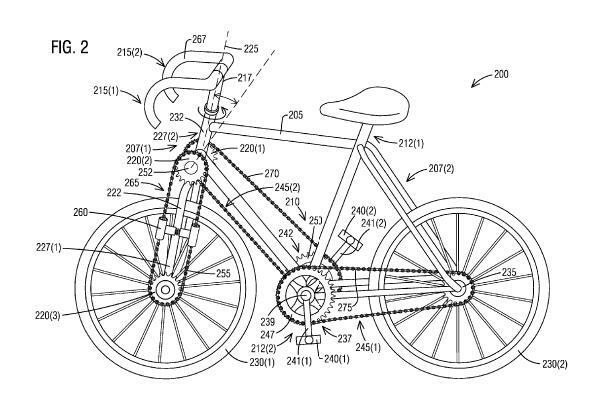 The patent is about a two-wheel-drive bicycle that includes a dual chain-and-sprocket drive mechanism mated with a two-opposite-sided paddle-main-sprocket system is provided. The two-wheel-drive bicycle further comprises a chain-driven front-drive mechanism configured for transmitting rotational power to the front wheel. The multi-sprocket systems enable setting different gear ratios for the front and rear wheels, selectively providing a different drive force/torque to both wheels. By providing a torque power separately to both rear and front wheels from the same paddles using the dual chain-and-sprocket drive mechanism, the two wheel drive bicycle will run more stable and have a better traction control over a road surface just like the 4 X 4 vehicles. A multi-wheel-drive bicycle that includes a dual chain-and-sprocket drive mechanism mated with a two-opposite-sided paddle-main-sprocket system is provided. The multi-wheel-drive bicycle comprises a frame having first and second opposing sides and having front, rear and lower ends. A front wheel is rotatably mounted on the front end of the frame and a rear wheel is rotatably mounted on the rear end of the frame. The multi-wheel-drive bicycle further comprises a chain-driven rear-drive mechanism configured for transmitting rotational power to the rear wheel. The chain-driven rear-drive mechanism includes a rear main-drive sprocket disposed on the first side of the frame and located at the lower end of the frame. The multi-wheel-drive bicycle further comprises a chain-driven front-drive mechanism configured for transmitting rotational power to the front wheel. The chain-driven front-drive mechanism includes a front main-drive sprocket disposed on the second side of the frame being opposite of the first side of the frame and located at the lower end of the frame. Page created at 2019-04-23 6:11:17, Patent Auction Time.